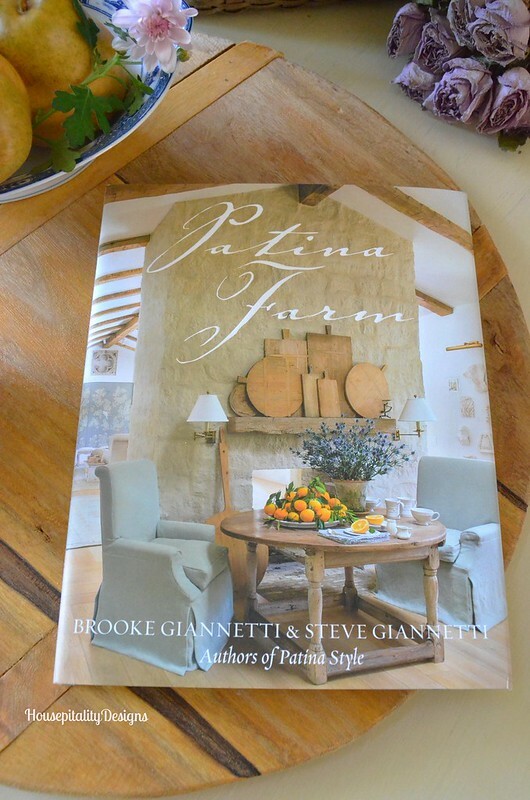 The book, Patina Farm, by Brooke and Steve Giannetti. It was on my wish list and my friend Kim had ordered one and told me it was amazing! So it went from my wish list to my order list …. and Kim is right, it is amazing! and I successfully did this when I created the coffee table vignette. On the cover of the book there is a gorgeous plate of citrus with leaves. I did not have any oranges on hand, so these pears actually fit the bill. with the mums that were originally on the antique French buffet for Easter. I placed the mums in one of my antique baskets. and I may just need to be on the lookout for a flower pot such as that fabulous one! You see, you do not have to mimic an image exactly. Use your own things to create that feel. I added a candle for some ambiance. A cup of coffee to enjoy while I smile at the new look on the table. as Patina Farm did, but for now, I shall admire them from afar. Have a wonderful day filled with great inspiration! Nice! I can see how the book inspired you! It looks intriguing. Love all the breadboards on the mantel too. How lovely are those? Your table looks wonderful. Thanks for sharing how to get a look using what’s on hand! Yes I get inspired by you and all the other blogging ladies. Thank you for all your inspiration and sharing your lovely home. This is beautiful and you did a fabulous job of creating your own version! It is the best book and it is going with me on my travels today since hubby will be driving. 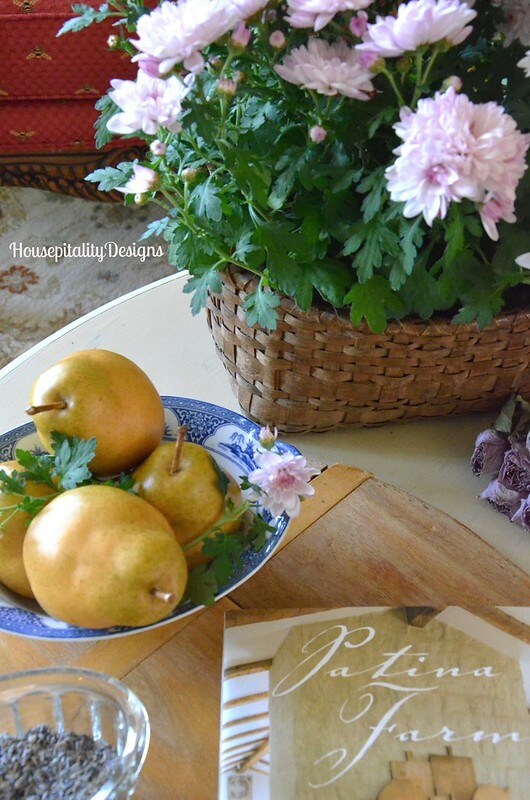 The vignette looks beautiful, and I like the pears with it! I can just imagine that book…I actually saved that cover picture on to one of my pinterest boards some time ago! 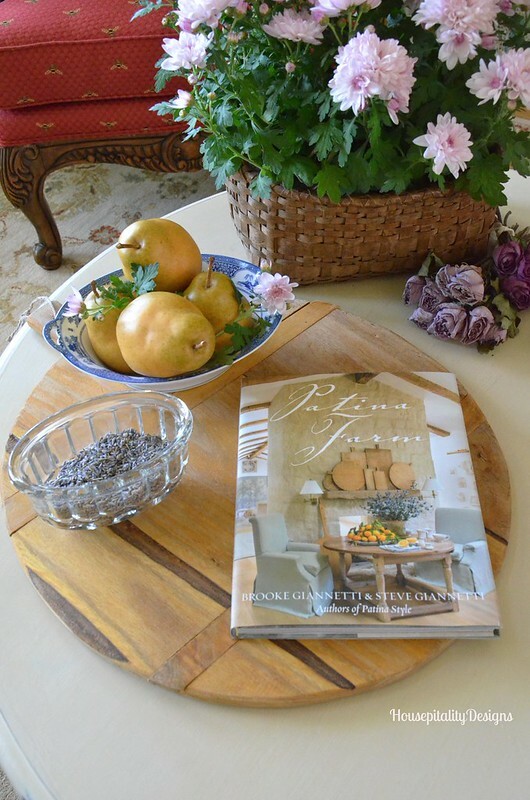 The Gianetti’s home is very soothing to the eyes, and I just love her color palette in that new home! Gorgeous! I love how you took the inspiration and ran with it! Lovely… Now, I love me some breadboards, don’t get me wrong, I just don’t like them on the mantel. Not everyone they owned lined up. Maybe a couple interspersed with other items…but that’s just me. I do understand the concept of collections, really I do LOL! 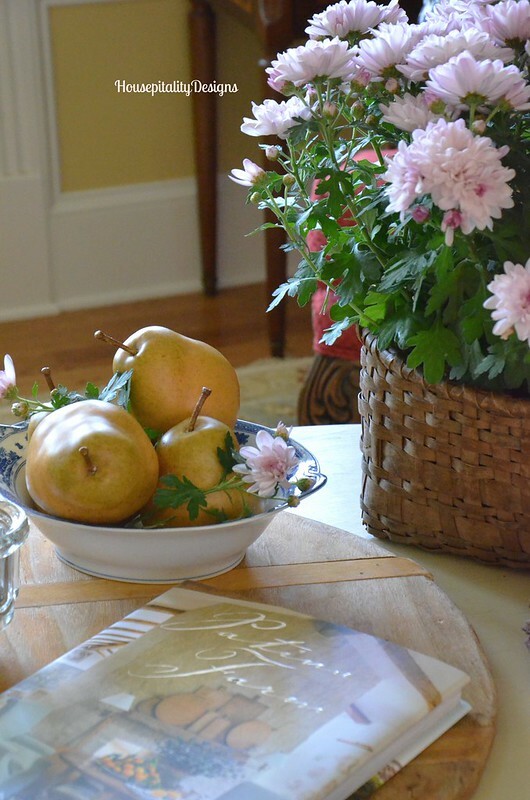 Beautiful vignette and I love the book. I can understand how you were inspired. Looks great Shirley! Love the breadboards! Looks great Shirley! You found some wonderful inspiration and made it your own. Penny at the Comforts of Home’s recent post…Don’t You Just Love It When? So charming, Shirley! I, too, get inspirations from everywhere, especially from bloggers like you. Every time I log onto a blogger site, I’m excited because there is always some nice surprise waiting. 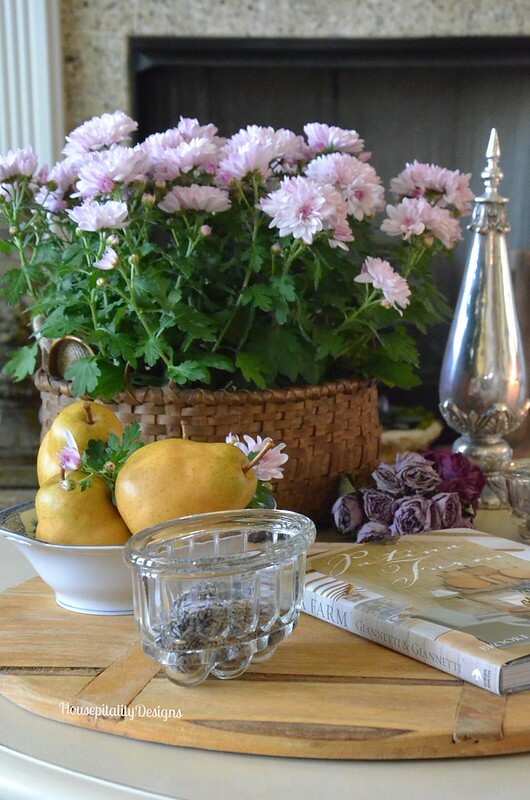 Sometimes it’s great advice, sometimes a beautifully set table, and sometimes a simple pot with gorgeous flowers–you never know, but it’s all wonderfully uplifting. 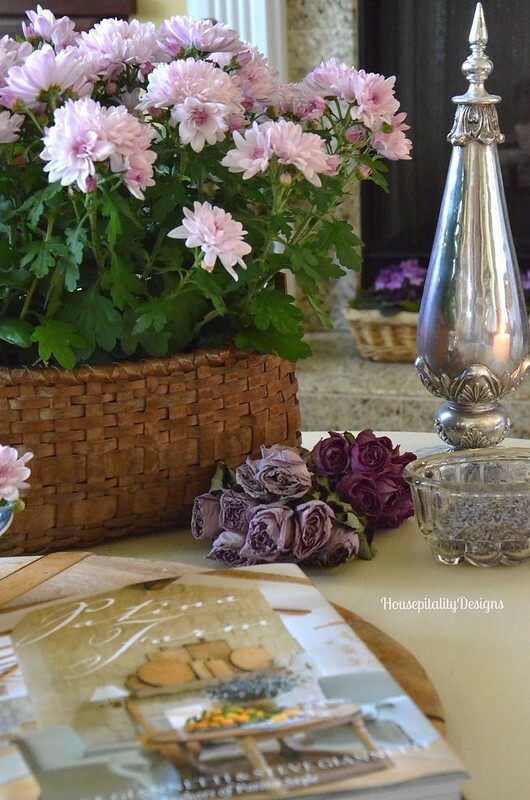 Thank you for your blog and for sharing your beautiful home and inspirations. When in college and very cash strapped, I made bread boards for gifts just out of pine. My Mom still had hers 35 years later and it had a great patina. You could make a collection if you really wanted them. They don’t have to be useable only decorative. I love that you shared where your inspiration came from. But, you took an idea and made it your own! You are very talented and your home showcases your beautiful creativity! What a beautiful, peaceful vignette. It looks just like you! Inspiration is everywhere. Your home inspires me! You are a blessing! Love your blog, STILL! Love your version of the vignette, Shirley!! I also love your mantel…not crazy about breadboards on mantel. Everything is pretty!!! Hi Shirley! 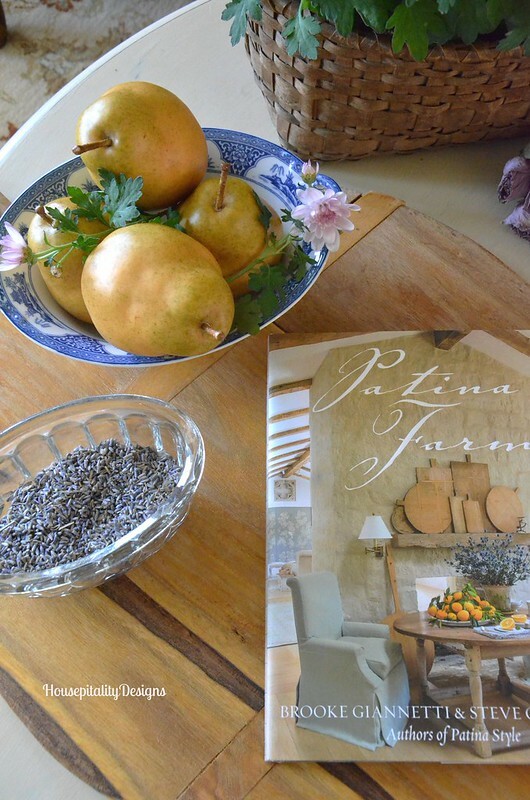 Isn’t Patina Farm stunning? 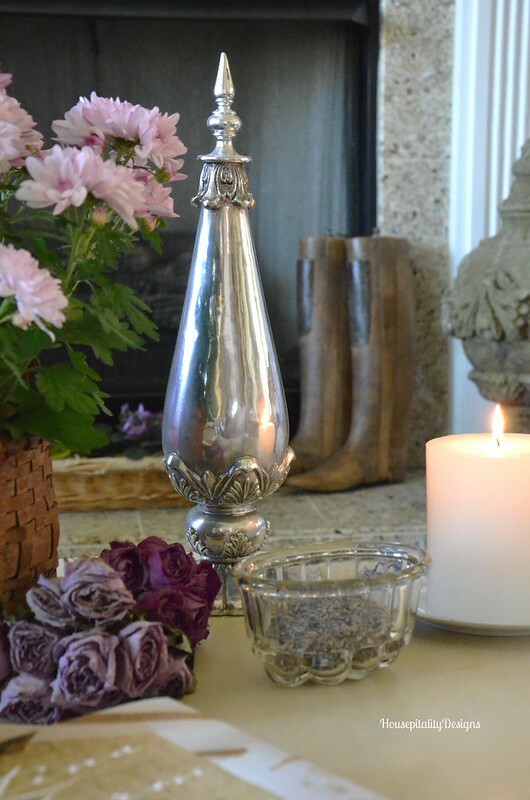 The beautiful vignettes look so effortless. Love your styling! What is that silver piece? Is it a finial? I’ve never seen one like it. I love your rendition of the magazine inspiration. I loved when I used to host the copy cat challenge. 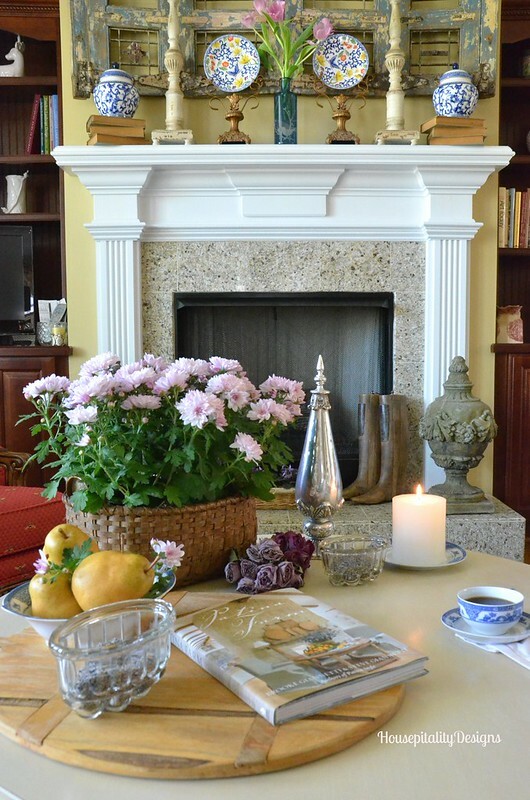 Vignettes were my favorite thing to copy:) Your mantel is beautiful too Shirley. You are such a fabulous decorator.